In the wake of tragedy, it is inspiring to witness the compassion of those who so selflessly reach out to help others. 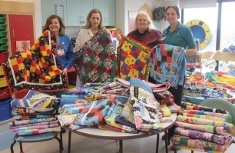 As part of their relief effort after Hurricane Sandy, Quilts for Kids – a nonprofit organization that creates and delivers homemade quilts to help comfort hospitalized children – recently donated 60 quilts to Winthrop’s Child Life Program. This is the second donation that Quilts for Kids has made to the Hospital, having also donated 25 quilts to the Cancer Center for Kids in October. The quilts were donated through the Downy Touch of Comfort program, which, in partnership with Quilts for Kids, helps provide comforting quilts and a touch of home to hospitalized children. These brand new quilts are handmade by volunteers using donated materials, and are currently being disseminated to children who are battling chronic illnesses during their Hospital stay. Pictured at the donation are Lorraine Martone, RN; Mary Ann Dziomba, RN, Nurse Manager, Pediatrics/PICU; Carrie Davis of Long Island Quilts for Kids; and Nikki Adams, Certified Child Life Specialist. 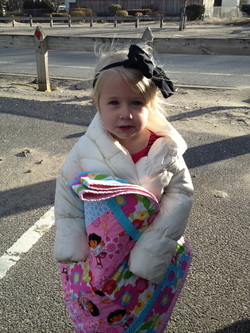 For more information about Quilts for Kids, visit www.longislandquiltsforkids or contact Carrie Davis at 631-764-1394. For more information about Winthrop’s Child Life Program, visit www.winthrop.org or call 1-866-WINTHROP. QFK Long Island Chapter Leader, Carrie Davis, is still personally delivering hundreds of quilts to children affected by the devastation of Hurricane Sandy. As many of us, even in the northeast, get on with our lives, parts of New Jersey and New York remain devastated. A quilt for a child might seem a small thing in the face of such devastation, but each one puts a smile on a child's face and gives her something of her own to cling to. Please help us. You can send us your stash quilts, donate money for shipping, drop off packing tape and boxes (24"x24") if you live locally, or send us new, 100% cotton fabric in kid-friendly prints.